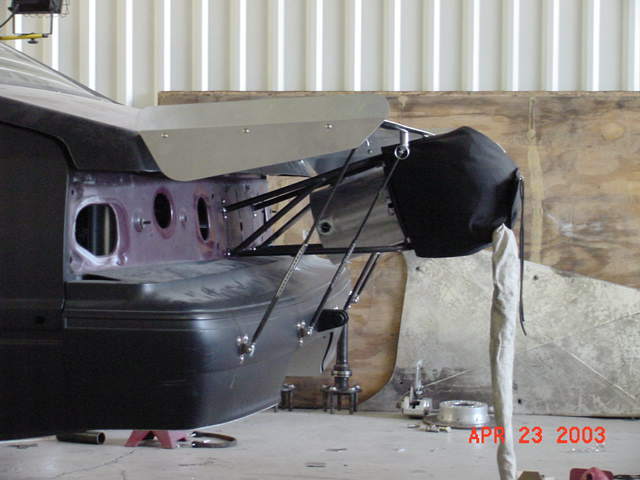 This is a picture of our new car with only the chassis work complete. 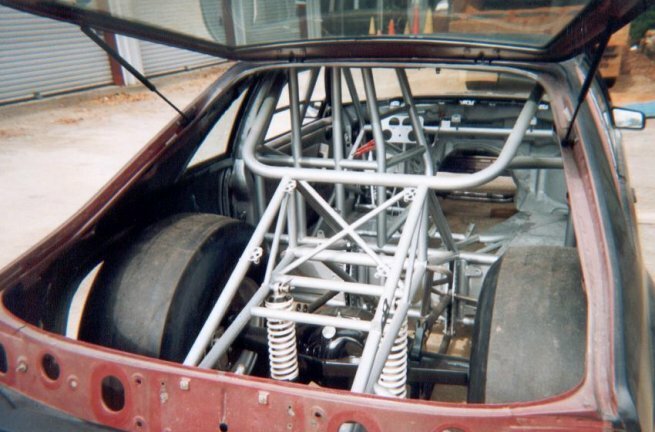 This was before the new 25.2 chassis ruling so we thought we were legal with the 25.1c. Little did we know, but a lot of the bars had to be replaced, as well as adding a few more as well to be safe with the added weight required for Outlaw ten-five. 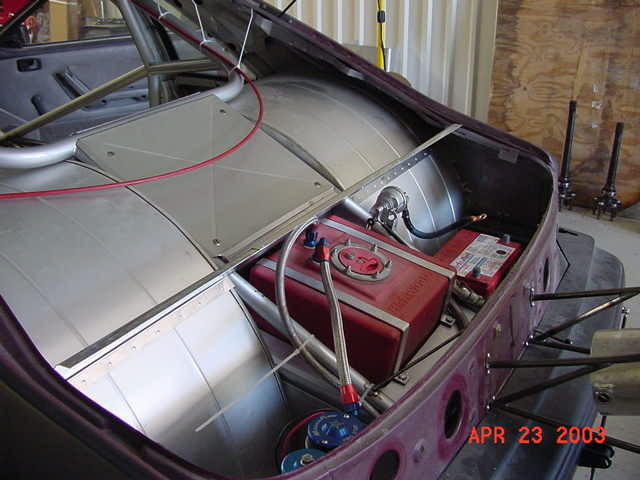 This shows the removable acess panel for shock, and sway bar adjustment, as well as the fuel cell, pump, filter, battery, and disconnect. 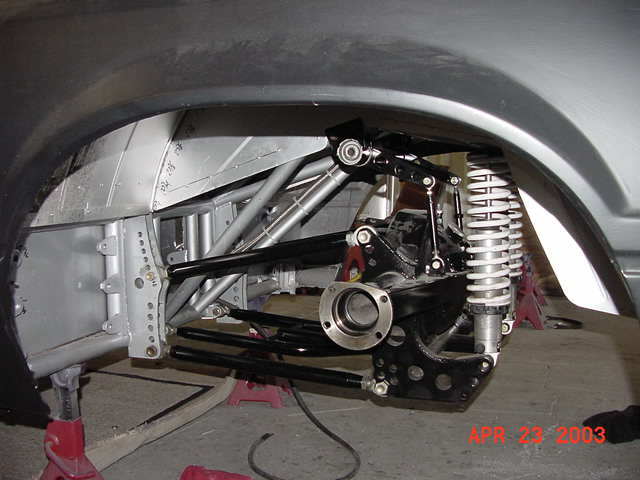 This picture shows the Anthony Jones Chromoly K Frame, as well as their A-Arms and coil over conversion. The brakes are made by Aerospace. 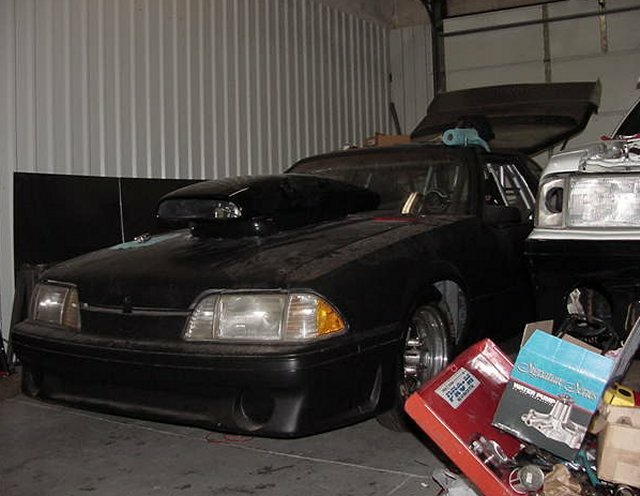 Yes believe it or not this is the same engine compartment. The red was originally designed as a factory color for the Dodge Viper, but it looks pretty nice on our Mustang. You can also see Ron Cates Open Comp. racecar in the background of this picture. 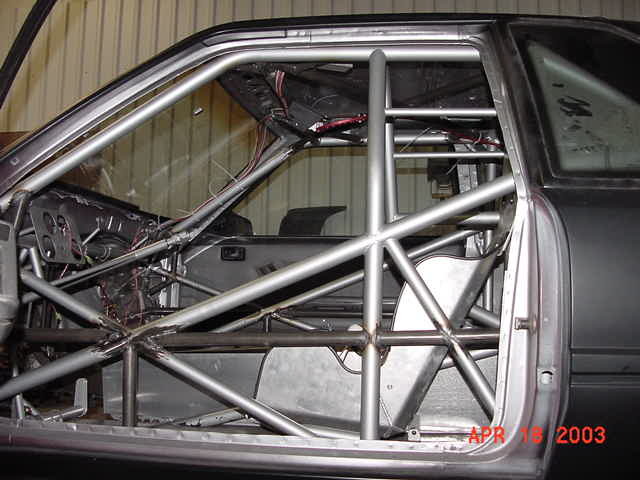 These pictures show a few of the new bars we had to add to make the car 25.2 legal. 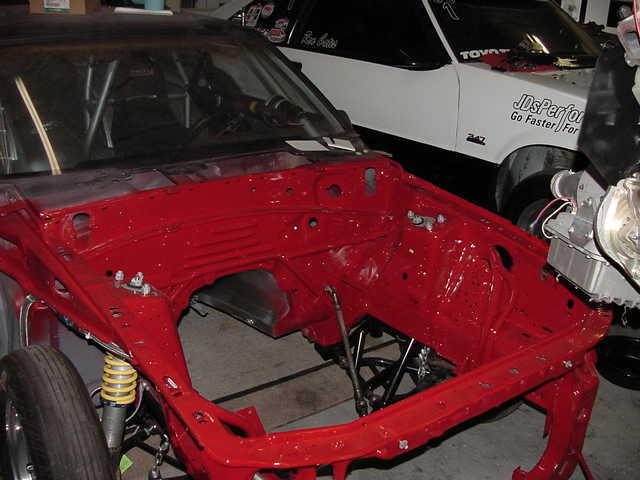 If you look closely you can see the new X in the roof as well as larger tube gussets.... Back to the paint shop.......This certification will allow the car to be legal to run as quick as 6.50 e.t. at up to 3200 lbs. 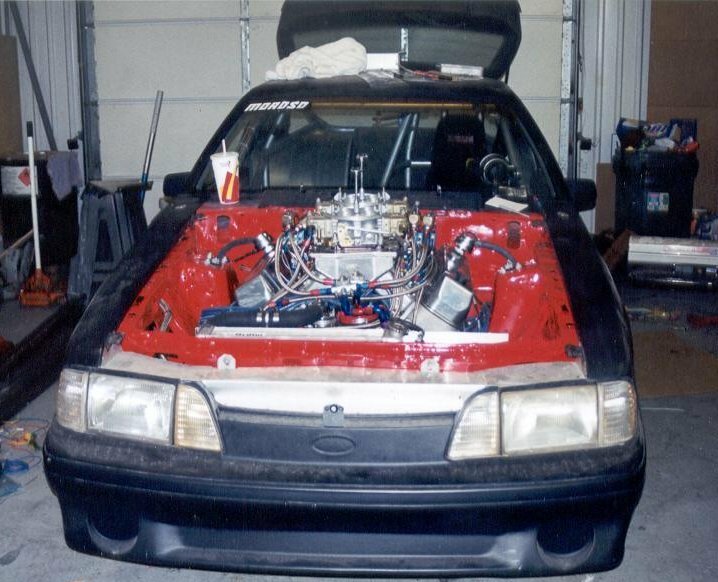 I honestly don't see Outlaw cars running that quick for a number of years, but we wanted to make sure the car was safe and legal. 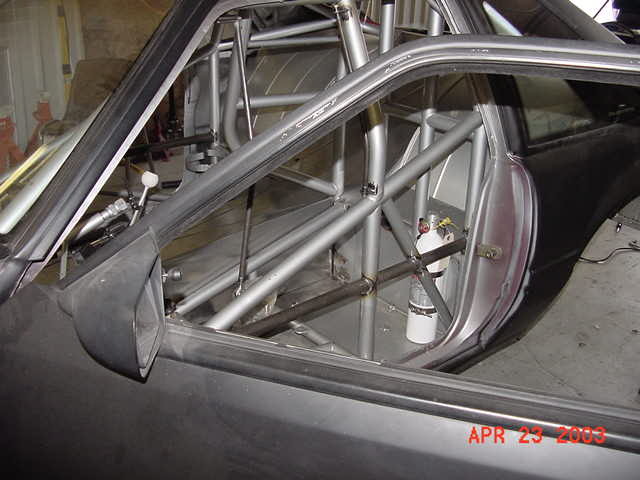 This picture shows our Halon fire suppression system, and if you look on the other side of the car, you can see the custom NOS bottle bracket. Skinny Kid Race Cars Wing, and Stroud Cannon Launcher Chute. 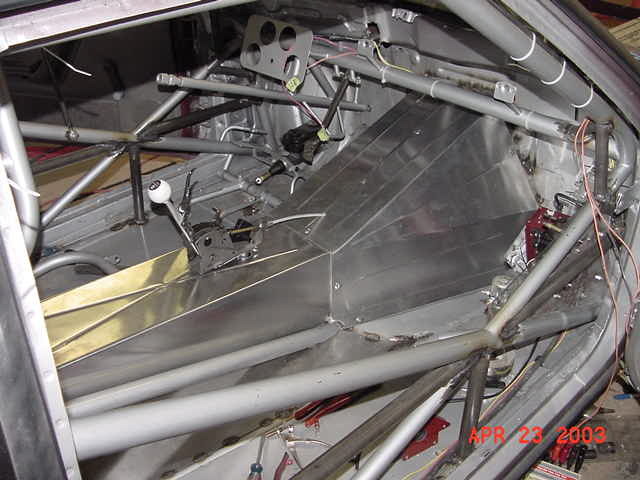 The custom chute mount was done by Shaw Motorsports. 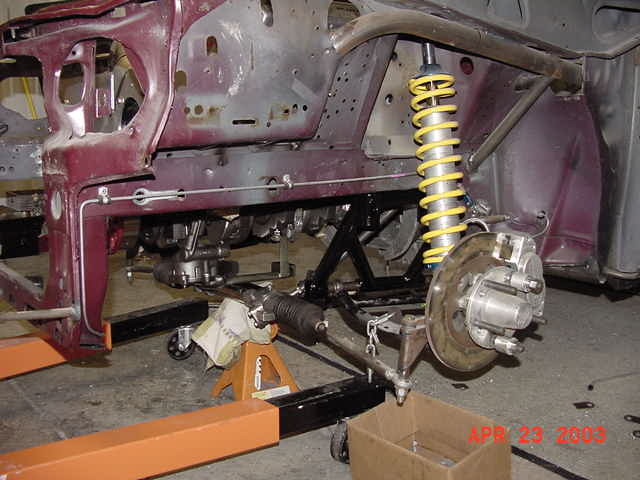 This picture shows the car with the suspension out and at the powder coaters. You can see in this photo that it was worth the wait. They did a great job coating everything. Thanks, Shaw Motorsports! This shows the car pretty much all together and ready to go out for initial testing. You can even see whats left of someone's Mickey D's.......more than likely mine. 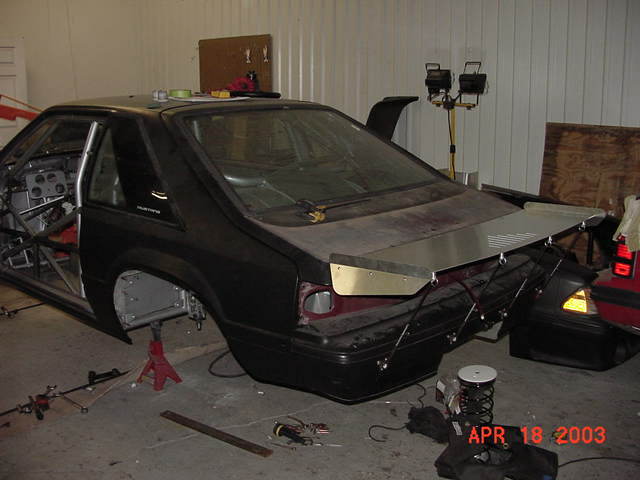 This photo shows the car with the composite front clip, and pro stock style scoop mounted and ready to go. This Picture is after an all nighter. We were rewarded with a couple of shakedown motor only runs.